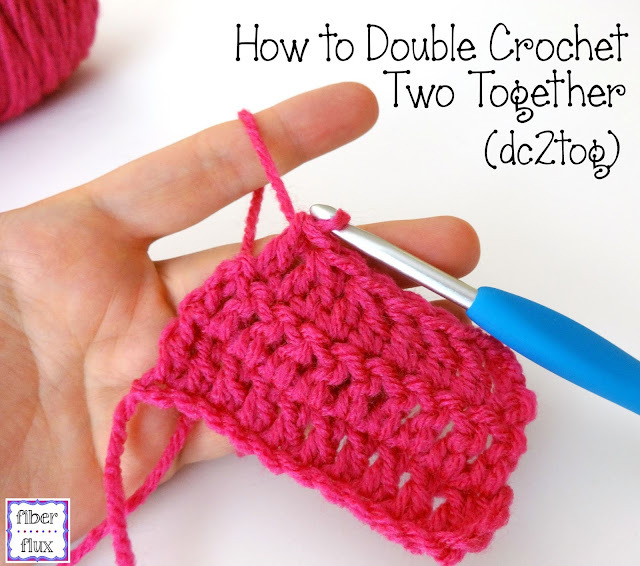 The double crochet two together or dc2tog is a common decrease that is easy to do. It makes a neat and smooth transition when shaping things like hats and lots more! Below is a step by step photo tutorial, plus a full video tutorial too! Step 1: Wrap yarn around hook and insert hook into stitch. Step 2: Wrap yarn around hook and bring up a loop (3 loops on the hook). Step 3: Wrap yarn around hook and bring it through the first two loops (two loops on the hook). Step 4: Wrap yarn around hook. Step 5: Insert hook into the next stitch and bring up a loop (four loops on the hook). Step 6: Wrap yarn around hook and bring it through the first two loops (three loops on the hook). Step 7: Wrap yarn around hook and bring it through all three loops. in crochet and found, in a text pattern the instruction for 2sctog and had no idea what they were talking about ... I supouse is not too different to the dc2tog ... thank you ! !